1) Since Mars has only 15% of Earth’s volume, Martian gravity is only 37% of the Earth’s. Meaning you could jump 3x higher on Mars than on Earth. 2) In this particular image you can see the BIGGEST volcano in the Solar System. This beast is 21 km high (compared to Mt. Everest’s 8 km) and a whopping 600 km in diameter. Even though this volcano formed over billions of years, many scientists believe this volcano is still active. 3) Average temperatures on Mars is about -60 degrees C or maybe you rather be closer to the equator where it’s about 20 degrees C! It also snows on Mars! 4) If you were to compare how the sun looks in the sky on Earth vs. on Mars, the sun would look half the size on Mars. 5) Out of the total of 47 missions there have only been 19 successful ones! 6) Mars has the largest dust storms in the Solar System. These dust storms can last for MONTHS and cover the ENTIRE planet. 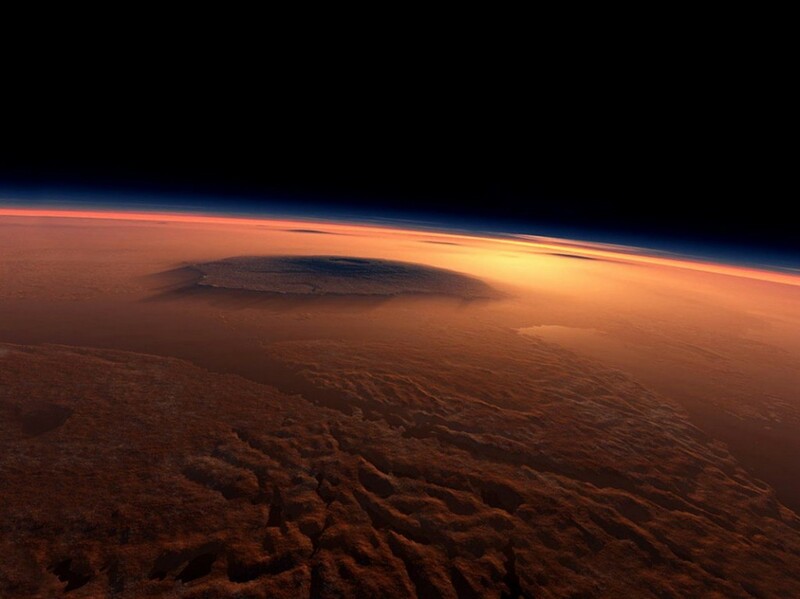 7) Scientists have found meteorites with traces of martian atmosphere. It’s believed that these rocks were ejected from Mars travelled the solar system for millions of years then landed on Earth. This allowed scientists to study Mars before launching any missions there. 8) In 2013 Mars rover Curiosity made an astonishing discovery that Mars contained 2% of water by weight. That means that astronauts could extract 2 pints of water for every cubic foot of Martian soil. 9) The polar caps on Mars are frozen year round and have layers of ice. Additional caps are created during wintertime. They are made out of carbon dioxide or “dry ice.” In the deepest part of winter this frost can extend halfway to the equator. 10) The seasons are more dramatic on Mars due to the elliptical, oval-shaped orbit which is more elongated than any other planet. When Mars is tilted towards the sun it gives it an effect of very short and hot summers, while in the northern hemisphere very cold winters. Have a wonderful day and hope you learned something otherwise leave a comment below and let us know what else is cool about Mars! Not a problem! Thanks for stopping by and checking my blog out, I always appreciate it.